Prothsaahan 2015 - lifting the spirits. 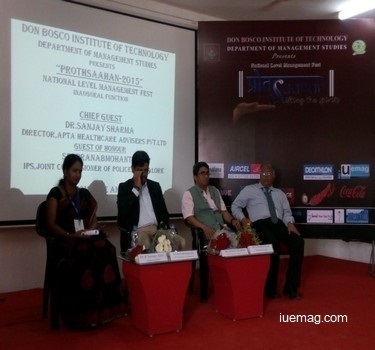 Department of Management Studies and Research, DBIT organized national level management fest on 30th of March 2015 and 31st of March 2015, where in participants from various colleges across Bangalore and also from different parts of the country witnessed this massive event. All the participants participated enthusiastically in all the events. Prothsaahan had a great support from Aircel (Print partners), Radio Mirchi (Radio partners), Deccan Herald (Print media partners), Coca Cola (Beverage partners), Blue Fills (Thirst partners), iUeMagazine (Online media partners), Himalaya (Cosmetics partners), Sri Vinayaka Industries, Jet Kings, Red Age, Brota, Stock Market Institute. At the valedictory function, directors A P Arjun, producer K P Srikanth, actor Dhananjay were special guests. RNSIT College team was the overall winner and raised the winning trophy.